Rightmove founder Ed Williams had disposed of 1.14m shares, equivalent to a 1pc stake. The disposal represents around half of Mr Williams’ stake in the business but Rightmove refused to comment on the reasons for the sale. 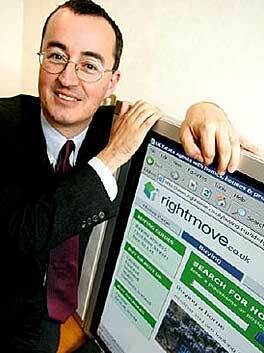 Rightmove’s first managing director in 2000, founded the rightmove.co.uk website that formed the basis of the group. He has sold nearly 1.14m shares at 699.9325p each. That leaves him with 1.1% of Rightmove. The imminent increase in the rate of capital gains tax may have been in his mind when he decided to sell. The disposal was made last Friday ahead of today’s announcement of house price inflation figures by Rightmove. The annual rate of house price inflation picked up from 4.3% to 5%, but Rightmove expects this to ease back as conditions get tougher later in the year. The co-founders of Rightmove became paper millionaires when the company was floated in March 2006 at a value of around £425m by its leading shareholders Countrywide, Connells, HBOS and Royal & Sun Alliance.